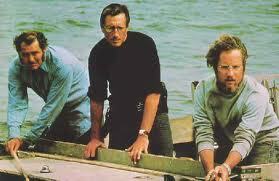 As monster movies go Jaws (1975) tops my list. The killing machine that threatened the little island community of Amity was shot on Martha’s Vineyard. 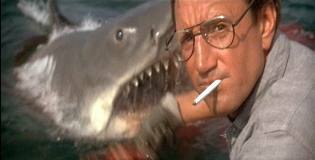 The first time we see the shark’s jaws – which is about a third of the way into the movie – is through Chief Brody’s eyes. He is the lesser shark hunter to the sea worthy Quint and Hooper, throwing chum in the water and pissed off with his lowly job until the monster emerges, shooting out of the water. His response after seeing the giant maw full of rows and rows of huge teeth is the now classic line “You’re gonna need a bigger boat”. Fritzi Cohen who portrayed a concerned business owner in Amity, utters a less famous line, although a line I might add that spoke to the economic worries of an entire town that is dependent on summer tourism. She says in response to some dimwit who asks “Uh, is that 3,000 dollar bounty on the shark in cash or check? “That’s not funny. That’s not funny at all”. I interviewed her a while back for a public access show Kari did in the 1990’s. The segment was called “When Dreams Come True: The Fritzi Cohen Interview”. And there was no irony there. Kari did me a solid in setting up the interview. I took full advantage of having a cast member from Jaws for sixty uninterrupted minutes. She was held captive by a camera and me. Fritzi showed up with her own lighting guy – a sweet skate punk who adored her. I was nicely lit as a result. 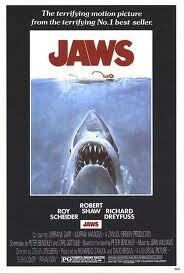 Kari had found wonderful 1970’s orange swivel chairs with a Jaws poster as our back-drop. I asked nerdy questions about Jaws and, she, graciously answered them. Right before the cameras rolled she handed me her extensive extra/walk on/one or two line appearances in film and television. She said I know you want to talk about Jaws but if you run out of questions here is my resume. Ask me anything. I didn’t run out of questions. I had painstakingly written a list of questions about Jaws and I asked all of them. Her answers thrillingly led down many different paths about the making of the movie. Roy Scheider was nice, tanned a lot and kept to himself. Richard Dreyfuss was loud (maybe that meant drunk? ), and Robert Shaw was “Something!” (again, she might have meant drunk but she was so nice about discussing each of them). And, “Stevie Spielberg was great”. Yes, Stevie. Back to the movie and to the great chemistry between Scheider’s Brody and Dreyfuss’ Hooper: nice bonding scene when they need to get drunk in order to cut open a shark and quite possibly have the little Kintner boy spill out. Then the topper of all bonding scenes when the three hunters are together on the boat theAuroraand they share their scars to one another. Of course Captain Quint has the worst and saddest scar of all. Post traumatic stress syndrome in a man who is not aware of it at all can be deadly. This sets up one of the best scenes in the movie – theIndianapolismonologue. A horrible and accurate war time account of sharks feasting on American soldiers in the South Pacific, after they helped deliver the H-bomb their boat is bombed. It is a brilliant piece of writing by writer-for-hire John Milius and the actor who played Quint, Robert Shaw. Story has it they holed up together in Shaw’s Martha’s Vineyard bungalow for a weekend and wrote the scene. Show me the way to go home. I’m tired and I want to go to sleep. I had a little drink about an hour…. A good friend of mine is from The Vineyard. I have stayed there more than once with she and her family. Her family indulges me – touring different Jaws sites and telling me the most mundane details of that summer Stevie and his crew were on their island so I could learn just one more local moment of this movie I love so much. Monsters and their hunters are two sides of the same coin. One does not exist without the other. I feel sorry for the shark. That’s me, though, and as summer is going away and the crisp nights of autumn are upon us it might be a good time to watch the monster of all monster movies. And say goodbye to summer for another year. Farewell and adieu to you fair Spanish ladies… (that last one is for the Jaws fans like me).